Last week, the staff at my day job took a two-day retreat from the ocean and went up into the mountains to do some volunteer service at one of my organization’s terrestrial nature reserves on Hawaii Island. We spent time retrofitting a mile of pig fence to make it safer for endangered bats—it seems the barbed wire on the top of the fence can catch a bat’s wings as it flies along the fence line, so we replaced the barbed wire with smooth wire. I’ve never done fencing before, so it was interesting to see how it was done. We had it easy because the hard work is cutting a fence line for a new fence. We were retrofitting, so all we had to do was cut off the barbed wire and clip new smooth wire in its place. Pretty easy work, but it takes time and patience. We retrofitted about a mile of six-foot pig fence that traversed native cloud forest. It wasn’t all work, however. We had a chance to hike through some wet ohia and koa forest. For the non-islanders, these are native Hawaiian trees, and koa in particular is commercially important because it’s wood is incredibly beautiful (Google it to take a look). 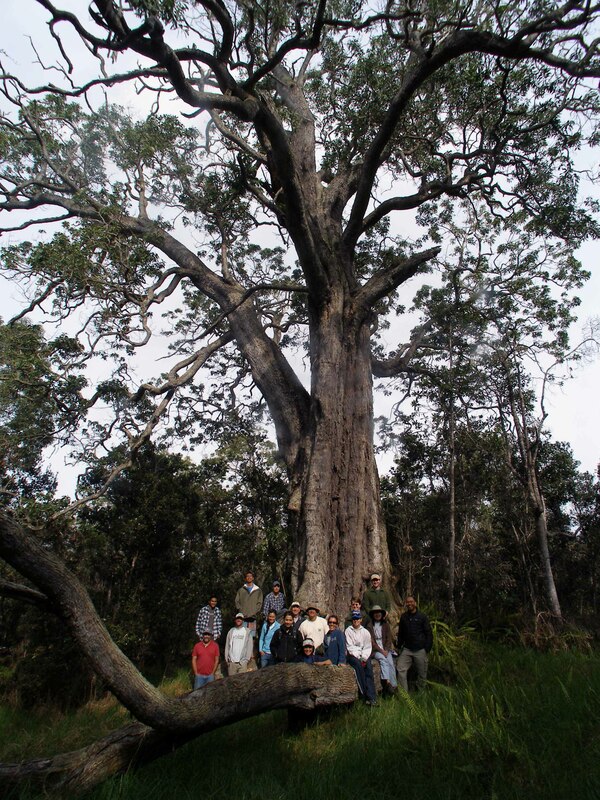 Both koa and ohia are ecologically important in native Hawaiian forest. While hiking, we saw the world’s oldest koa tree, estimated by the reserve staff to be around 500 years old. That’s a big tree—those tiny people around its base are me and the crew! I find it amazing that this tree was a seedling in 1512. It’s hard to imagine how different Hawaii—not to mention the entire world—was at that time. Here’s hoping this incredible tree sees a few more centuries. Thanks for stopping in. Hawaii is an amazing place, especially the islands other than Oahu and Maui, so be sure it gets off your bucket list and onto your done list! That much is true at least! There’s no wonder they’re endangered if you prevent them from evolving a respect for barbed wire! Sheesh!